Madh Island, a group of villages and comparatively cleaner beaches in the northern side of Mumbai, is a great place for a staycation. Located away from the humdrum of the city, it has a peaceful vibe and beautiful surroundings to keep you entertained. You can stroll the beaches while eating the local fruits and roasted corn cobs, with sand under your feet and sea in sight. Madh Island is also the go-to shooting place for the entire entertainment industry. That is the reason, we reckon, the resorts here are built in a picturesque manner offering more that you’d ask. Here are some of the best resorts in Madh Island. Spread over a vast 5-acre land is the Green Village resort which has comfortable rooms, a plush pool with slides and lush green lawns to hang at. If you’re looking for a gang hang out place, then this is the right choice given its spacious surroundings and other facilities like party halls, recreational centre and health station. It has an all-day dining restaurant with a full bar. And if you enquire in advance, you can also enjoy their yoga and aerobics activities. Located on the shoreline of the Arabian Sea, The Resort is a fully-equipped property with spa, health centre, conference halls, restaurant, bar, free Wi-Fi, airport transport, pool, gym and a salon too. Depending on how much your pocket allows and the number of people in your squad, you can choose between their standard rooms that faces the garden, deluxe rooms which overlooks the pool and the sea, villas that offer luxury and privacy, and suites which also have a sea view. Their prices fluctuate depending on the season and dates, so it’s best to call and check for the current price. 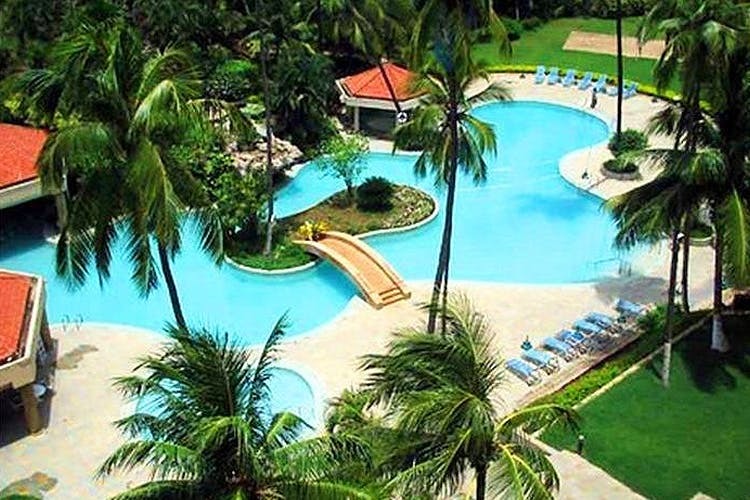 Swaying palm trees, walking distance from the beach, and a pool to chill in. If that sounds interesting to you then check-in at Samara Gardens for a quaint weekend. Known for their hospitality, it has all amenities including a doctor on call. You can engage in a game of badminton here or get your competitive side channelised with a game of volleyball. An ideal getaway, get the prices on call (they will first ask you for dates and then give out tariffs basis availability) and have a fun time. Serene surrounding and a complete list of amenities makes The Retreat in Madh Island quite the pick. An azure blue swimming pool, lavish rooms, interesting landscaping and cocktails at the sunken bar. They even have an open-air jacuzzi, and therapy massages at their health centre. And for those who’re perpetually feeling competitive, there are games on premises that include volleyball, water polo, billiards, table tennis, and more. Their rooms are divided in five categories – deluxe room, executive room, superior suite, deluxe suite and presidential suite. Excited, much? Saina Resort is for the restless. A natural looking waterfall, a water park, musical rain dance, a mini-amusement park, and electrical rides – this vacay already has so much to do. But those who want to peacefully spend their time, don’t stress out yet as the surreal surroundings, a mini mango orchard, and a beach nearby will restore your sanity almost instantly. Madh Island is believed to be haunted by a lady clad in white saree. While you’ll have a great time here at these resorts, we suggest you don’t wander around alone at night.